Leading the Apple (NASDAQ:AAPL) rumor mill today is news of more Haptic Touch features coming to the iPhone XR. Today, we’ll look at that and other Apple Rumors for Thursday. Haptic Touch: Apple is planning to add more Haptic Touch options to the iPhone XR, reports 9to5Mac. The new features for Haptic Touch were found in the second beta for iOS 12.1.1. Of note is the ability to expand messages and notifications with the use of Haptic Touch. More Haptic Touch features appearing in the iOS 12.1.1 beta lines up with previous statements from AAPL about adding more Haptic Touch options for the smartphone. Repairability: Apple’s 2018 MacBook Air is easier to repair than some other models, iFixit notes. A recent teardown guide from the publication shows that some changes have been made to make the laptop easier to repair. This includes the addition of adhesive pull tabs to remove the battery. It also features an easier method of removing the bottom of the device than in other previous MacBook devices. Overall, the 2018 MacBook Air earns a Repairability score of 3 out of 10. This means it is still difficult to repair, but improvements have been made. iPhone XR Orders: There may be another reason that Apple’s iPhone XR orders are lower than expected, reports BGR. A recent report claims that problems with the quality of printed circuit boards heading for the iPhone XR weren’t up to snuff. This may explain a previous rumor claiming that AAPL was reducing orders of the iPhone XR on lower demand. 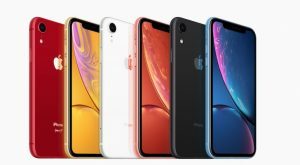 Article printed from InvestorPlace Media, https://investorplace.com/2018/11/apple-iphone-xr-getting-more-haptic-touch-options/.